The Deering company of Lemon Grove California has been one of the most respected manufacturer of high-end banjos for decades. 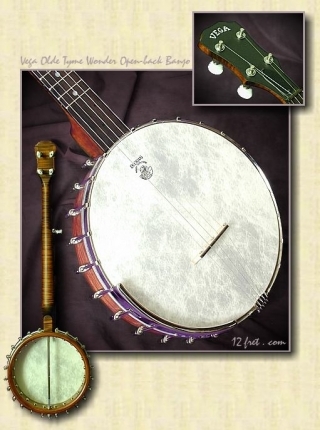 Their Vega line of open-back clawhammer banjos are packed with features and priced very modestly. The latest model in the Vega banjo line is the ‘ Olde Tyme Wonder ‘ which features a hand applied ‘Warm Brown’ stain over highly flamed maple finished with a matte lacquer. Some matte finishes feel coarse under your hands, but these instruments have been wet sanded and then hand pumiced to achieve a silky smooth feel with almost no friction or stickiness. The fingerboard scoop at the 17th fret is much appreciated by many old time frailers who ‘dig in’ and double thumb in this area and sometimes catch a nail on the fret ends. Nice touch Vega !!! * Two way adjustable truss rod. PRICING: $1789 Canadian dollars, or $1409 US dollars, based on 1.27% exchange rate.